Join our Volunteer team, creating fun and memorable guest experiences at the Zoo! We currently offer two flexible and fun short-term Volunteer opportunities: Wildlife Health Centre Interpretive Volunteers and Volunteer Hosts. 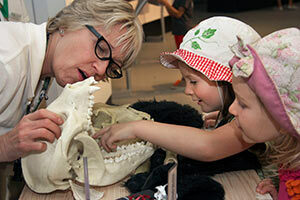 Toronto Zoo Wildlife Health Centre Interpretive Volunteers showcase the incredible work that goes on behind-the-scenes at the Zoo by providing guest engagement and facilitating activities for kids and families in our Wildlife Health Centre viewing gallery. This opportunity is for adults (not appropriate for secondary school students). Enjoy taking a leadership role and communicating with others. Organized with the ability to take direction well. Appreciation for wildlife and nature and the desire to learn more. 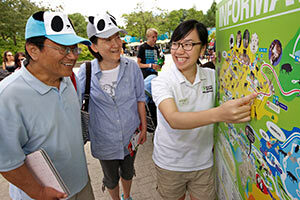 Toronto Zoo Volunteer Hosts are friendly and welcoming faces for Zoo guests, providing information and directional assistance at various outdoor locations on the Zoo site. Good with directions. Knowledge of the Zoo site an asset, but not mandatory. These short-term Volunteer opportunities involve a commitment of 50 (or more) volunteer hours carried out between May 1 and October 31. Weekday and weekend, morning and afternoon shifts are available. Volunteers select their own preferred day(s) and times to complete their duties. Zoo Volunteers receive free admission for themselves and two guests, as well as free Zoomobile rides and a discount at the Zoo shop. Zoo Volunteers fulfill an educational role and do not have contact with our plants or animals, nor behind-the-scenes access to the Wildlife Health Centre. Are you interested in a more in-depth volunteer experience? Click through to our Year-Round Volunteer and Summer Information Volunteer opportunities.